Open daily from 10AM to 6PM by appointment only. Please check our website at www.ackermanfamilyvineyards.com and look for The Aviary to make your appointment. Thank you! Our vineyards are located in the Coombsville area of southern Napa Valley, we are a small boutique winery that produces a handcrafted, 100% Cabernet Sauvignon from our just-under 16 acre hillside vineyard (11 acres planted). We have been making wine for ourselves since 1995 to better understand the nuances of our terroir and began selling our first "commercial" vintage of our 2003 Ackerman Family Vineyards Cabernet Sauvignon in October 2007. We sell direct-to-consumer and through restaurants and high-end retailers in multiple states. Our total production averages about 700 cases per year. Our cabernet sauvignon wines are typically smooth, yet complex, with a deep berry body and a subtle spice, smoke, chocolate and black cherry finish. Due to our more temperate location in the southeastern part of Napa Valley, our wines typically tend to have alcohols ranging between 13.5% and 14.5% and have a moderate level of acidity which enables them to easily pair with food. We barrel age for two years in new French Oak and then bottle age for an additional two years before we release each fall. We like wines that blend well with food and can be aged for 7 to 10 years or beyond for even more complexity. We also farm organically and received our CCOF certification in the fall of 2009. Currently, we are the only CCOF vineyard in the Coombsville area. We have our newly constructed tasting salon, The Aviary, open by appointment from 10AM to 6PM daily in downtown Napa. Please visit our website to make your appointment for one of several tasting options. We welcome you to visit The Aviary and step back into the historic era of Napa to enjoy artisan wines from Ackerman Family Vineyards and Lloyd Cellars. 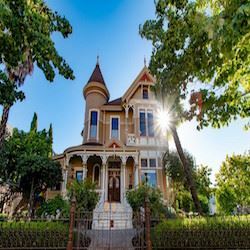 Within walking distance of the exquisite restaurants and shops of downtown Napa, The Aviary at The Ackerman Heritage House provides guests a unique wine tasting experience. The Aviary offers the opportunity to relax as you learn about the historic Ackerman Heritage property, the family stories behind it while enjoying our acclaimed wines. Historical Tours and Tastings By Appointment Only. Walk-In Tastings at The Aviary, restored carriage house behind the Victorian, available Thursday - Sunday 10:00a,m. - 5:00 p.m.
To join the wine club, visit www.ackermanfamilyvineyards.com or call 855-238-9463. Our program, "Keys to the Cellar" provides three different levels of participation with our limited production wines. Please see our website for more information: www.ackermanfamilyvineyards.com Thank you!